What is the Overhead Squat? The overhead squat is an exercise technique used in strength training to build muscle. It involves a normal squat technique with a barbell or a set of weights added for more resistance. A barbell is most commonly used, especially by athletes or those who want to build muscle quickly. Others may choose dumbbells for a lighter workout, or may choose to use no weights. To perform the overhead squat, the person stands with his feet about hip width apart. A barbell is placed either on the floor in front of him, or on a rack. If the barbell is on a rack, the squatter will lower his body underneath the barbell to lift it. After assuming the position, he will squat down while bending his knees until he is almost sitting on the floor. At this point he will grab the barbell and lift it over his head. After gaining his balance and ensuring the weight is not too heavy, he lifts back up into the starting position. It's important for for the person to push with his legs for maximum benefits and to avoid injury. Once reaching the starting position, he then lowers back down into a squat. He repeats raising and lowering his body as many times as desired. Then he lowers the barbell back to the floor, or rack, and proceeds with the rest of his exercise routine. Those who do not want to use a barbell may hold a dumbbell in each hand and lift their arms over their heads while squatting. This is still considered an overhead squat, but the person will raise his arms either straight up in front of him or up from the sides and over his head. Those who do not use weights mimic the motion of lifting the barbell or dumbbells only without the actual weights. An overhead squat helps strengthen the lower back, provide increased flexibility, and builds overall body strength. The arms, legs, and back all get a workout from lowering and lifting the weight. While strength trainers use heavier barbells, those using the exercise for a regular fitness routine can get the same benefits using little or no weight. Proper technique is important to avoid injury. Weights should never be heavier than the person can lift, and the person should not squat all the way to the floor if it is too difficult to stand back up. Before trying the overhead squat, it's best to find a fitness or exercise coach to assess the performer's fitness level and recommend the best technique for starting out. Placing the feet in the proper position and practicing the squat without weights is the key to learning the squat properly to avoid hurting the legs or knees. 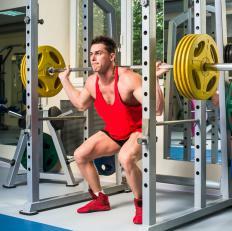 What are the Different Types of Squat Workout? What is a Squat Jump? 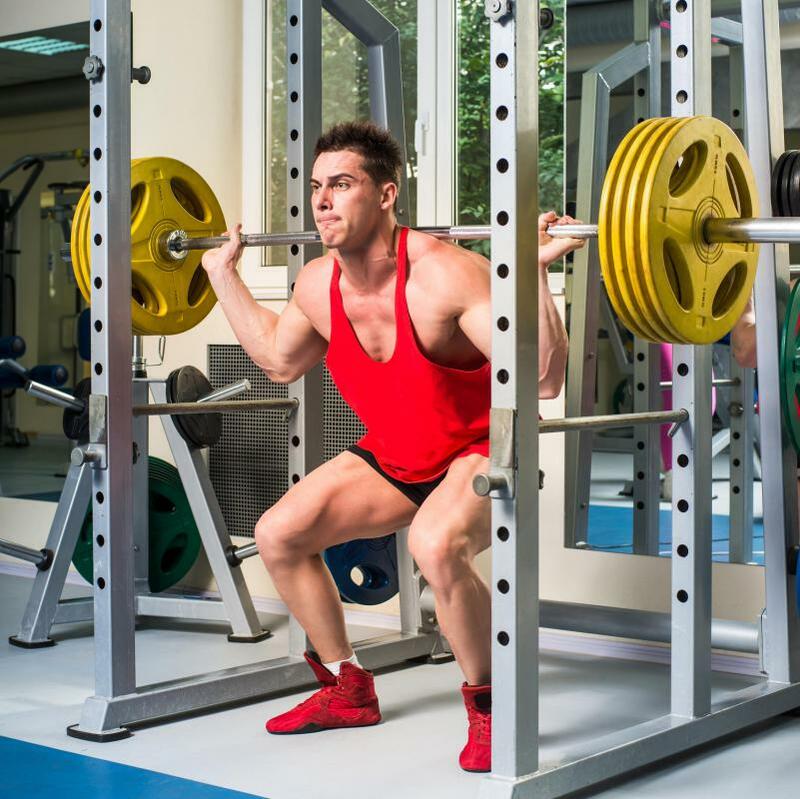 What is a Squat Cage?